Made with 100% estate-owned Cortese grapes, this Gavi is a wine that reflects its terroir with a crisp, flinty and fresh acidity, coming from the mineral-rich soils of the area. Pale yellow in color, this Gavi offers intense floral notes on the nose with hints of melon and citrus. It is a well-balanced wine, distinctly fruit driven with underlying hints of almonds on the finish. It is ideal as an aperitif or when served with savory canapes and hors d’oeuvres. Ideal for serving with delicate fish-based first courses or with the typical ‘tajarin al tartufo’, a pasta dish topped with truffles, butter and parmesan cheese. 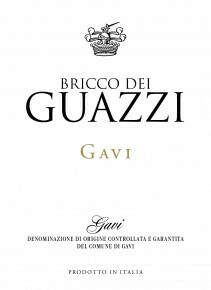 Gavi is considered Piedmont’s white jewel in the crown and Italy’s first white wine to gain international repute. Made exclusively from the Cortese grape, a variety which has a heritage dating back to the 1600s. It gained DOCG status in 1998 and its vineyards are mainly found in the hills of 13 communes in the province of Alessandria. Those wines that state Gavi di Gavi on their label can do so only if their fruit comes from vineyards in the township of Gavi. Grapes are pressed softly, and fermentation takes place in stainless steel at controlled temperatures. After fermentation, the wine ages on the lees for at least 4 months, and then it is bottled.